3 days Big North by train motorcycling with 3 nights accommodation. Day 1: Lao Cai – Bac Ha. 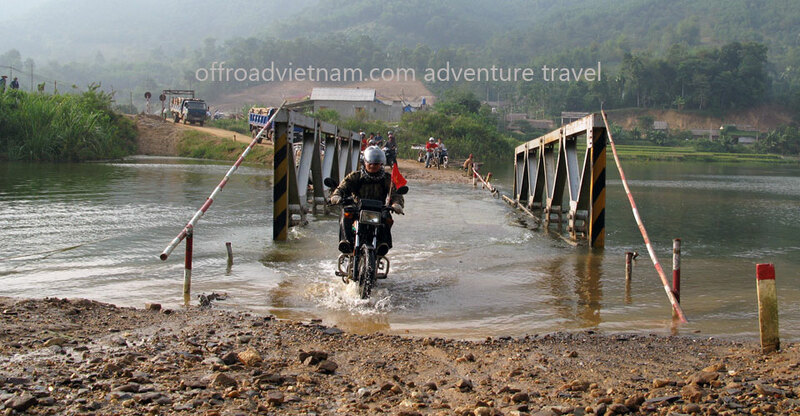 ~75 km, ~2 h.
We propose to ride directly to Bac Ha on sealed mountainous road with many curves. It is only 2 hours riding, thus we have time to stop a lot and have activities such as go walking, visiting ethnic villages (H’mong village of Ban Pho to meet H’mong women union for example) or depending on your date go to ethnic market (Can Cau on Saturday morning, Bac Ha on Sunday). Day 2: Bac Ha – Luc Yen – Vu Linh. ~180 km, ~6 h.
We start the day by strolling around Bac Ha to meet with many ethnic villages in this area. We then move towards the lake Thac Ba. From Bac Ha to Luc Yen, the road is easy and sealed all the way. After Luc Yen, we take a small dirt track bordered by palm trees, in the middle of the karsts. Finally, arrive at Vu Linh, a traditional village of Dao where we sleep in the family of our friends. The welcome is exceptional. Day 3: Vu Linh – Hanoi. ~180 km, ~7 h.
Pass through the lake with motorbike by boat. Come back to Hanoi by Song Thao. This is, in fact, a very nice road. We arrive in town around 3 to 4pm, before rush hours. Contact us now to book this tour or to know about different itineraries and options of this 3 Days Big North By Train Motorcycling. Below is a video with some portions of this 3 days Big North by train motorcycling. In case you want to watch more videos of our Vietnam motorbike tours please check our YouTube channel. Could you send me information about tour BN301? We are 5 adults and we will be in Hanoi next December. Dear Ignacio. This trip costs more than a standard trip due to the train travel up to Lao Cai on the first night. The price for taking the train up is 80$US/person (your tickets, bike tickets and our guide’s ticket). The tour price depends on the type of bikes you wish to ride which you can see here. Let us know your thoughts about the prices before we discuss more details of this trip.